New Tactics: challenges and opportunities. We have to make revolution at the point of time when there is neither socialist block or socialist base nor even a socialist state to support the revolution from out side. However, it is not the first time in the history of the world proletarian revolution that this type of situation our class, the proletariat and the oppressed people of the world had to encounter with. When our class threw itself in a great adventure of overthrowing the rule of bourgeoisie by making revolution in a capitalist country, which gave birth to Paris Commune, an exemplary event in the entire history of mankind, had no scope of acquiring support from any state from out side. Though it could not stay and sustain for long, it was definitely a glaring example and source of inspiration for the proletariat and all oppressed people of the world, which demonstrated and proved that the proletariat and the oppressed class have the capacity to overthrow the rule of the bourgeoisie and have its own ability to rule. Though the life of the entirely new state was merely 72 days, it was able to make new history that inspired the revolutionaries of the world for many generations, to change the world by making revolution. It succeeded in establishing the indelible notion that the proletariat and the working class is capable to seize power and has the power to rule. It was undeniably a new experiment made by our class for the first time in the world history. The imprint and inspiration that Paris Commune has imparted will never be forgotten though definitely it will be required to draw positive as well as negative lessons from this exceptionally exemplary event of the world history. The earth shaking Russian Revolution of 1917, led by the Bolshevik Communist Party under the leadership of Lenin, was a new development. It was the first successful revolution in the history of the world based clearly on Marxism, which gave rise to world communist movement to grow in unprecedented magnitude. Marx had predicted that the socialist revolution will take place first in the advanced capitalist countries. But Russia was not an advanced capitalist country during that time. But great Lenin propounded the theory of development of capitalism to its higher stage, imperialism and formulated the strategy and tactics of socialist revolution in the countries like Russia. Really it was a break from the earlier concept that the socialist revolution can occur first in the developed capitalist country or countries. Lenin fought a vigorous political battle with Trotsky, his own colleague, who preached that according to the teaching of Marx the socialist revolution being an international phenomenon, can not take place in a single country, and rather it should take place in several countries simultaneously. Right opposite to what Trotsky had said, Lenin brought forward that revolution can take place in a single country and he pin pointed that it was possible to make revolution in Russia which was the weak link of imperialism. Practice confirmed Lenin’s proposition to be correct, which paved the way for the development of the science of revolution to the higher stage, from Marxism to Marxism-Leninism. Thus the Russian revolution represented a new development followed by a new experiment, which was proven to be correct and later conceived as the model of revolution in the International Communist Movement. During the Chinese Revolution there was a big debate about which path it should follow. Against the formulation of encircling the cities through the country side based on the path of New Democratic Revolution, charted by Mao, Wang Ming tried to pursue the tactics and strategy of the Russian revolution construing it as the only model of revolution. But Wang Ming’s line of first carrying insurrection in the cities incurred a huge loss and set back to the Chinese Revolution. Mao’s formulation that China was a semi-feudal and semi-colonial country and thus the immediate stage of revolution was bourgeois democratic not the proletarian socialist, was proven to be correct. It was obvious that since the stage of revolution was different, it required different sets of strategy and tactics. The whole set of politico-military strategy formulated by Mao not only served the Chinese revolution to be successful but worked as a guide to the revolutions to take place in different countries of the world as well. Before it was proven to be a science of the proletarian revolution what the great leader Mao was doing in China was a new experiment which was proven to be correct and gave rise to the development of the invincible ideology of the proletariat. Though there was socialist camp and strong communist movement during the whole period of Chinese revolution, however the victory of the Chinese revolution was assured and determined by the internal factors like—concrete analysis of the concrete condition of the Chinese society, correct ideological and political line, correct tactics and strategy of the Communist Party of China etc. In all these aspects Mao made a big rupture due to which he was not only been able to lead the Chinese revolution to success, but he profoundly developed the science of the proletarian revolution as well to higher level of which Great Proletarian Cultural Revolution was its pinnacle. Thus he developed the invincible ideology of Marxism-Leninism to Marxism-Leninism-Maoism. As a result of the sad event of the death of Com. Mao in 1976 followed by capitalist restoration in China in the same year, the whole ICM suffered a huge set back, one of the biggest in its entire history. In the wake of these events, many negative developments were noticed in the ICM. As a result of these disappointing negative events, a number of communist parties lost confidence on the success of the revolution and adopted revisionist positions. But there were still many who chose not to give up the ideology and the path of revolution. They dared to carry on the task by condemning the capitalist restoration in China. Our glorious party was one of them. One of such communist parties, the Peruvian Communist Party made a tremendous break through by initiating a People’s War in mid 80s which inspired many around the world. During the course of its development, Chairman Gonzalo the most prominent leader of the party was captured by the state in the year 1992, followed by the arrest of some other prominent leaders, caused a big loss to the revolution. Though Com. Gonzalo called it as a ‘bend in the road’, but the magnitude of the loss appeared to be huge. The Peruvian revolution which took a centre stage during its victorious days is hardly any significant news for the press now a day. Though the huge loss is blamed solely for the capture of Chairman Gonzalo, but it is not the sufficient cause. Whatsoever, the loss inflicted by the PCP proved to be a great loss to the whole ICM and is thus a matter of internal struggle within the ICM. 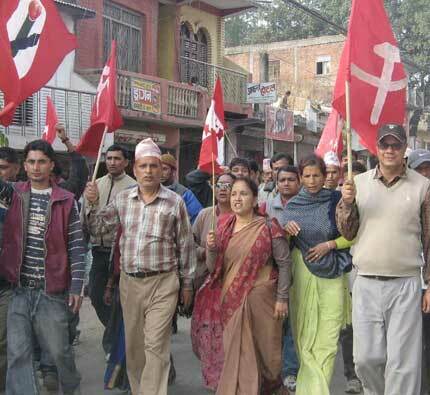 In the midst of such circumstances our glorious party, Communist Party of Nepal (Maoist) initiated the People’s War in Nepal in 13 February 1996. It developed in leaps and bounds thereby advancing from the stage of strategic defensive to strategic offensive during a span of 1O years. Construed People’s War as a total war, party has been able to carry on the military actions as well as the political intervention as two inseparable aspects in advancing the revolution. Party has been combining the armed struggle and the mass movement considering the armed struggle as principal and the mass movement as the subordinate to the armed struggle. Party considers the mass line as a question of vital importance to develop the people’s revolution. Without correct mass line it is not possible to incorporate the masses in the armed struggle. Without the incorporation of the masses in the People’s War it can not be considered as a real People’s War and victory can not be achieved and ensured. Our party, whose guiding ideology is Marxism-Leninism-Maoism and Prachanda Path, considers that in order to serve and develop the revolution, taking into consideration of the concrete situation, negotiation and diplomacy can also be considered as one among different forms of struggle. But it can not be considered as the principal aspect. Our party already entered into the process of negotiation two times before. But in both the occasions it failed to produce substantial results, because the other side undermined the strength of the revolution and simply ignored the demands put forward by the delegation of our party on the table. The third round of negotiation with the seven parliamentary parties is going on since November 2005. Ihe basis of negotiation is to over throw the monarchy which is ruling over Nepal since last 239 long years without break, through the process of election of constituent assembly. In order to accomplish it series of measures had been decided, such as interim constitution, formation of the interim legislature and interim government. None of these measures were implemented in stipulated time and under big political pressure from our side the process proceeds in quite a slow pace. In the same way the election of constituent assembly which is the major and central political issue was not also held in stipulated time and the whole process of negotiation is under the cloud and under question. Thus the validity of the negotiation has been called into question. Our party has clarified that in such a situation the interim constitution should be amended to declare the republic by the interim legislature. If the other parties disagree with it the country should go through another mass movement or another April Uprising to over throw the monarchy and establish the democratic republic. This line and the form of struggle adopted by our party is definitely a new experiment which entails both opportunities and challenges. There are definitely some examples in the ICM that the Communist Parties have participated in the parliament calling it as a pigsty. Bolshevik party participated in the election for a short period using it as a means to develop the revolutionary struggle. But there is not a single example that any revolutionary communist party has participated in the government what we did in Nepal. So, it is quite a new experience for the ICM. It is true that a big risk is involved in it. We are part of the new interim government in order to achieve some specific objectives. Firstly, election of constituent assembly is the central political question in Nepal and who wins the election is a decisive question for the success of this tactics. Our presence in the interim government is essential to pave the way for the victory of revolutionary forces in the election. Secondly, what we feel is that it is essential for us to develop the international relation with various forces including the liberal bourgeois democratic parties as well as the governments to ensure that the constitution to establish the People’s Democratic Republic and thereby the new government which will be in place after the election of constituent assembly can sustain even in a possibly harsh situation of embargo imposed by the imperialist power(s). We have entered into the process of this negotiation keeping the three magic instruments: The Communist Party, the People’s Liberation Army and the Organ of the Revolutionary United Front intact. Our party, the Communist Party of Nepal (Maoist) has definitely changed the tactical line and the form of struggle temporarily, but its basic line remains unchanged, its political and military strategy is same. Our immediate aim is to overthrow the autocratic monarchy and establish the New Democratic State. Keeping the three magic weapons intact, we are proceeding to the election of the constituent assembly, which will be instrumental in establishing the democratic republic by overthrowing the 239 [year] old monarchy. This is definitely a new and risky experiment. It can be a big blunder to decide the policy by fully depending on the possibility that the election will be held, because the monarchy, US imperialism and Hindu fascist forces of Indian ruling class are doing their best to disrupt the process of election by creating chaos, unrest and anarchy in Tarai or Madhes. Therefore our party is prepared for the other option. It will be native to think that the monarchy and the ruling class patronized by imperialism esp. the US imperialism will accept its own overthrow without any resistance. The autocratic monarchy is trying by hook or by crook for its come back. Though the new legislature has amended the new interim constitution adding that if there is substantial reason which confirms that the king is involved to sabotage the election of constituent assembly, two third majority of the legislature can abolish the monarchy and declare Nepal as republic. Nevertheless, it is not enough and guarantee of the success of republic. There is not a straight road for the revolution. There is not a smooth sailing for any successful revolution. Every revolution passes through many ups and downs, twists and turns and through many zigzags. Most of the revolutionaries agree with this political fact but when it requires applying it into practice, it is too difficult for many of them to understand it. Any successful revolution has some thing new and it requires new experiment. In every Socialist or New Democratic Revolution, there are some fundamental laws and ideological and political lines which are universally applicable and hold good, but succeeding revolution can not be replicated as the previous one. Every successful revolution discovers some thing which is new. When you are doing some new experiment there is always risk involved in it. If you dare not to take risk, you can not be successful in achieving new thing which is valuable. It is certainly easy to stand by every thing that is as usual and which has already been proven true and had been successful, because there is no risk involved in supporting it. It is quite easy now to support and eulogize the Russian socialist revolution and Chinese New Democratic Revolution. Since every revolution, socialist or new democratic, has to be accomplished in a new situation and requires new sets of tactics corresponding to the given situation, must take a risk, requires some daring decisions. In Nepal we are making New Democratic Revolution and according to the three stage of the People’s War it is in the concluding stage of ‘strategic offensive’. In order to achieve the countrywide victory, further preparation was felt necessary and the revolution had to take a new course. It was necessary to enter into the process of negotiation with the seven political parties to launch a strong mass movement whose immediate aim was to overthrow the monarchy, which is the representative institution of feudalism and bureaucratic capitalism and comprador bourgeoisie and establish democratic republic. It is true that the term ‘republic’ represents only a system without monarchy. There are many types of republic. What type of republic will be established and institutionalized in Nepal depends on who wins the majority in the election of the constituent assembly. If the left force gets majority in the assembly, there will be ‘People’s Democratic Republic’ in place and the constitution will be written and promulgated accordingly. In this context, it is definitely a new experiment based on Marxism-Leninism-Maoism and risk is involved into it. This new experiment should bring the desired result. If there is indication that the experiment is not going to deliver acceptable results, we should dare to deter such experiment and should be prepared for other experiments which can deliver the desired results. If we feel that the new experiment is not going to deliver the desired result, no body can compel us to be sticking into the same. In that case, the revolution will take a new course and further new experiment will be required that can help revolution to succeed. We know fairly well about the national as well as international significance of the ongoing people’s revolution in Nepal. Millions of the oppressed people and revolutionaries of the world have there eyes on the on going revolution of Nepal and it has become a symbol of hope and inspiration. Reached at the verge of success the Nepalese revolution has become a beacon for the world revolution. Let us hoist the red flag at the top of the Himalayas, which revolutionaries and the struggling people of the world can see and celebrate! The communist party and the revolutionary forces of every country must ready both hands, one for winning victory peacefully, one for taking power with violence. Neither may be dispensed with. It is essential to realize that, considering the general trend of things, the bourgeoisie has no intention of relinquishing its political power. They will put up a fight for it, and if their very life should be at stake, why should they not resort to force? In the October Revolution as in our own, both hands were ready. Before July 1917 Lenin did consider using peaceful methods to win the victory, but the July incident demonstrated that it would no longer be possible to transfer power to the proletariat peacefully. And not until he had reversed himself and carried out three months’ military preparation did he win the victory of the October Revolution. After the proletariat had seized political power in the course of the October Revolution Lenin remained inclined toward peaceful methods, using “redemption” to eliminate capitalism and put the socialist transformation into effect. But the bourgeoisie in collusion with fourteen imperialist powers launched counter-revolutionary armed up-risings and interventions.